The history of the farmhouse has very remote origins, and we find it in documents of the 13th century, where it is described as a place of worship built by monks dedicated to prayer and agriculture. The farm, after restoration, has uncovered some of its secrets, and became even more welcoming and hospitable. Each apartment guarantees the utmost comfort, the large pool overlooking the wonderful panorama is an irresistible recall on the sunny summer days in a unique atmosphere and relaxation. Despite being immersed in the green of the Maremma Toscana, it takes just a few minutes to reach the attractive and neighboring centers of cultural vocation or pure leisure. The farm is the result of a historic route born in an oasis of tranquility and authenticity of Tuscany, between the hills of Maremma and Mount Amiata, an enchanting area that extends to gather the caresses of the pristine Tyrrhenian sea. The farm's pool is divided into 3 different areas connected to each other by natural elements such as waterfalls immersed among the great natural rocks, trees and floral vegetation. The uniqueness and beauty of the pool is complemented by the slightly descending entrance of one of the pools into a pleasant beach effect and the presence of a luxurious Jacuzzi bathtub maintained at a constant temperature above 30 ° C. The scenery that extends to the sea is enchanting and beautiful and includes olive groves and vineyards. In the evening, the pool area enjoys the unforgettable sunset and the beautiful ambient lights allow you to relax in the water even in the nocturnal hours in a unique and unbelievable setting. Free Wi-fi in the pool. You find yourself in gorgeous surroundings. 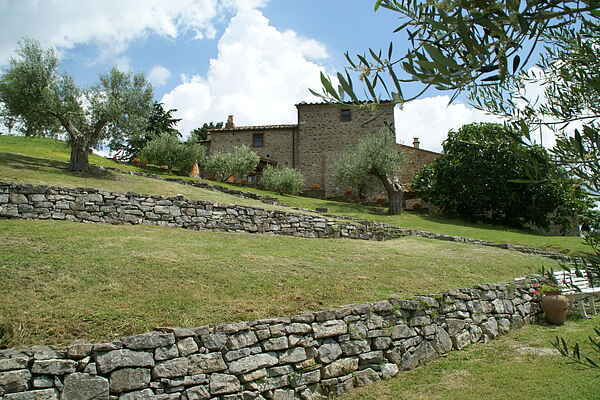 You will have access to the hills of Maremma and the imposing dormant volcano of Monte Amiata. With 1738 metres, this volcano is also the highest mountain in Tuscany . The volcano can easily be climbed and offers a perfect vista from the top. In the surrounding areas there are many castles and medieval villages. For instance, pay a visit to the castle of Roccalbegna (9 km). Also a visit to towns such as Scansano (30 km) and Pitigliano (40 km) are highly recommended. Both have a rich history. Of course, you can not miss Saturnia (25 km), just outside this charming village you can take a dip in some hot thermal springs.